Washington (CNN) - Republican Rep. Cynthia Lummis of Wyoming ripped Liz Cheney's decision to challenge Sen. Mike Enzi for his Senate seat next year in Wyoming as "bad form" and predicted she would lose in the GOP primary next year. "I don't know that anybody can out-conservative Mike Enzi," Lummis told reporters outside the House chamber on Tuesday. She also compared her to Hillary Clinton when she ran for senator in New York. The congresswoman, Wyoming's at-large representative, admitted Cheney had the upper hand in raising money, but said that wouldn't matter. "She will outraise him by factors of 10 or more, and he will still win because Wyoming is grassroots, retail campaigning." Cheney announced her 2014 campaign Monday in a YouTube video, the same day Enzi announced his intent to run for re-election. Lummis admitted she considered running for the Senate herself if Enzi, the state's senior senator, decided to retire. "I think she's skipping everyone over," Lummis said. "In the instance when you have a three term sitting U.S. senator who has does nothing to merit a primary challenge and you challenge that person without the courtesy of calling them just before you make your announcement, it's just not the best way to start a campaign," she added. On Cheney, Lummis said she's been attending events back in Wyoming, but said "even though she was the shiny new pony at those events, Mike Enzi was there as well talking to people, working hard, being Wyoming's senior U.S. Senator." Without saying the word "carpet bagger," Lummis leveled the charge that Cheney wasn't really from Wyoming, noting she grew up in Virginia. "It is a unique strategy to live your entire life elsewhere and then come to a state a year before you're going to announce you're going to run for that state's highest office," she said. Considering Wyoming's reliably red roots, perhaps Lummis' sharpest slap at Cheney came when she compared her to former Secretary of State Hillary Clinton. "Hillary Clinton could pull this off in New York. 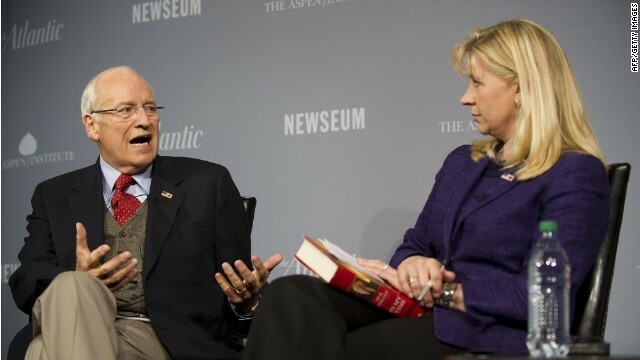 In my opinion, Liz Cheney cannot pull this off in Wyoming and I'm disappointed that she's decided to try," Lummis said. "She should run from Virginia." Cheney had the upper hand in raising money, but said that wouldn't matter. It's amazing how we Americans forget so fast . Running on her father's coattails. I am surprised my computer didn't explode with this picture of the two cheneys. I don't think that another Cheney should be in government except as a civil servant. Cheneys? Bad form? He's a war criminal (literally, he can't travel abroad to a number of nations). She's an opportunist. Perhaps being insanely wealthy on tax dollars scooped up by Haliburton, leaves one prone to not really having a home state because you can own and buy places anywhere. Ms. Cheney defines "carpetbagger". Yes, by all means let's have another Cheney in Washington because the last one worked out so well for us! Perhaps she can funnel MORE contracts to Halliburton or ink additional secret deals with oil companies? She's a Cheney what do you expect? Low-class, misinformed bigots who want to rule the world with their own style of ignorance. I sure wish she would take her daddy and her hate and disappear FOR GOOD. That's typical of republicans. When the going gets tough, they eat their own. The sooner they devour each other the better. Someone actually stood up against this nonsense. What a swipe saying she can't pull a win like Hillary and she's right. Why not run in VA? It makes sense if she's lived there longer and there are two sitting Democrats. Loser either way. What's scary (other than Liz Cheney as a US Senator) is that Wyoming, with less than 600 thousand residents, has the same vote in the Senate as California, with over 38 MILLION residents. Those Founding Fathers didn't get it ALL right. Why aren't there laws against *carpetbagging* elections? Politics are local, and if she isn't, she shouldn't be running. Hilarious. They are arguing about which one can be more of a knuckle dragging nendarthal trying to take us back in time 100 years. Welcome to the modern gop which is why it is a dying breed. Lives in Virginia, a state that is very purple and has a Democrat incumbent, but avoids that "tough" general election to go against the grain and challenge a three term GOP senator? What in the world is wrong with the Cheney family? Adolph Cheney's daughter hiding in the tea potty,spouting the buzz words that they fall hook,line and sinker for. Priceless. Ah.....the GOp/Tea Nuts eating their young. Their a violent uncaring species at best. Talk about an entitlement syndrome. The Cheney's really think their stuff don't stink, especially Liz. I hope the people of Wyoming see right through this scam and force her to waste her money and her supporter's money. We don't need anymore Cheney or bushes in public office, remember last time???? Does Liz Cheney really care about the people of Wyoming or Virginia?? NOT. She wants the big money from the corporate donors and power in the Senate. Like father like daughter – the apple did fall far from the tree. Power hunger is written all over the walls in the Cheney family. ha ha....There is no one, I repeat no one, that is more vapid and clueless that a GOP/Tea Tard....Heck Liz Freakshow Cheney for President. Right TeaTards? You folks are the comedy relief we need. Yes it's time to get another Chaney on the government dole. I can't imagine putting anyone in that family back in a position of power to once again try and destroy the country. Hey Lummis: you expecting class from a Cheney? Hey....Steveo, Fair is Fair, California, Ray E. Ricky Mc, and People of the State of ILL....Here's your future president? LOL..... Do you folks ever wonder why some one like Darth Cheney's spawn is such divisive, polarizing figure and no one sees her candidacy as anything other than fool hardy? how about THE MAJORITY OF AMERICANS think that' GOP/Tea Tard policies are a path to destruction. Good luck trying to convince anyone with an IQ above room temperature otherwise.